I love creating new recipes for my family. What can I say, I’m a foodie! I create simple, easy to make recipes that families can enjoy together. 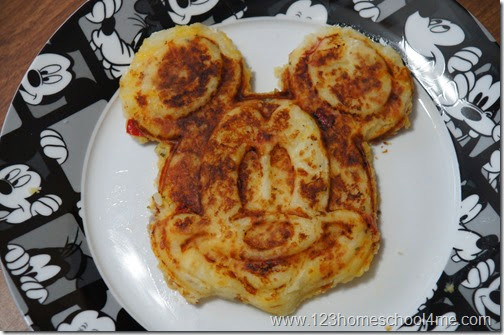 Today I want to share with you how I turned mashed potato leftovers into delicious Mickey Potato Waffles. 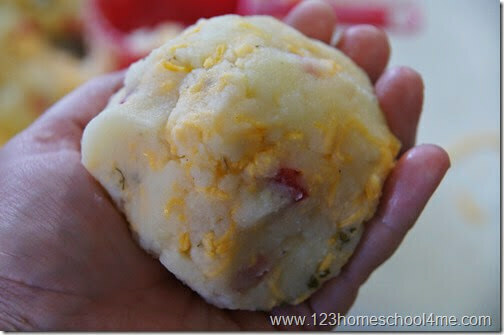 Make a large ball of loaded mashed potatoes – about the size of your fist. Now using a plate with about 1/2 cup flour, coat your mashed potato ball top, bottom and sides. (This helps it to not stick). Now put your potato ball in the center of a warm waffle iron. Press the lid closed to flatten somewhat as you close it. Now cook until golden brown. Note: It takes longer to cook a potato waffle than a regular waffle. It will take about 5 minutes. And you need it to be golden brown so it comes out easily in one piece. You can use a fork and spatula if you need. In our house, we like to add a little Disney magic to our days (as you can tell by our plates!) So in our house, we make our Potato Waffles in our Mickey Waffle Iron and enjoy Mickey Potato Waffles. These Loaded Potato Waffles are to die for! Use leftover mashed potatoes to make these quick, easy, and scrumptious breakfast treat! 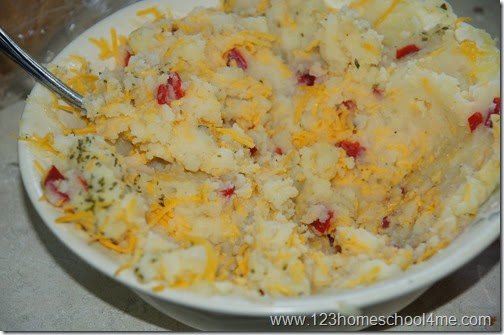 Mix mashed potatoes, cheese, red pepper, onion, and egg. 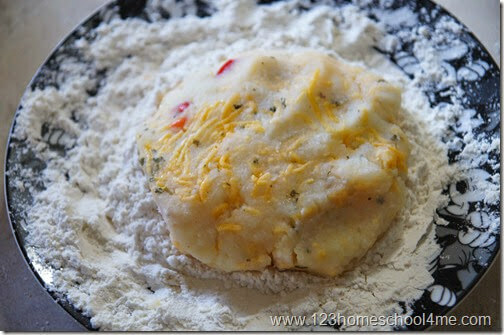 On a plate with your flour, coat your mashed potato ball top, bottom and sides. (This helps it to not stick). 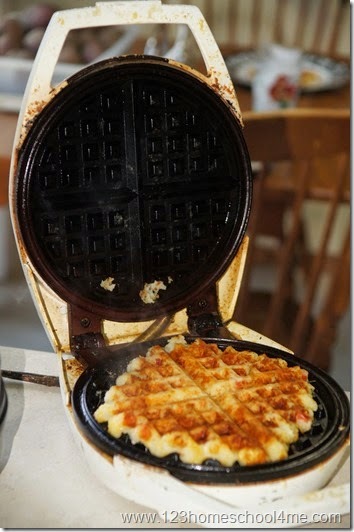 Now put your potato ball in the center of a warm waffle iron. Press the lid closed to flatten somewhat as you close it. Now cook until golden brown ~ about 5 minutes.